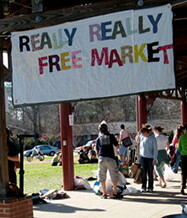 According to the capitalist lexicon, the “Free Market” is the economic system in which prices are determined by unrestricted competition between privately owned businesses. Any sensible person can recognize immediately that neither human beings nor resources are free in such a system; hence, a “Really Really Free Market” is a market that operates according to gift economics, in which nothing is for sale and the only rule is share and share alike. In the interest of not taxing the reader’s patience, a single apostrophe stands in for the two “Really”s throughout this text.